This photo is a close up of Scott's demo piece. It shows the first pass of the contour drawing done from life, transfered onto the canvas....... the first pass of underpainting and the beginning of his form method of painting. This is Scott working on the small color poster study of the model at the Gemini School of Art and Communication. This past September I attended a portrait drawing/painting from life workshop with Scott Waddell. It was held at the Gemini School of Art and Communication in Austin, Texas. 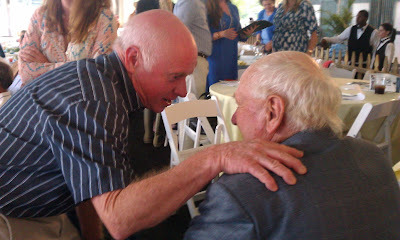 The only thing I knew when I signed up was I loved Scott's work and that I needed to do whatever I could to get there. I was just hoping that he was a good communicator. I was NOT disappointed. Scott's energy was non stop and he gave his all to make sure that each student ( about 15 all together) received attention and individual help along the way. He left you feeling that you understood what it was that was holding your own progress back and a clear understanding of what to do about it ! I was so inspired by his ability to articulate what he was trying to teach us about drawing/ painting and capturing a likeness in the portrait. I admire many styles of painting the portrait...but I was searching for what resonated with how I am naturally drawn to draw and paint. This was it. It brought me literally to tears to have the light bulb come on for me and the way I needed to approach painting the portrait. My general understanding was made so much more clear with Scott's approach. Is it a "faster" approach?....no. Is it an "easier" approach?...no. Is it an approach full of gimmicks and tricks?....NO. 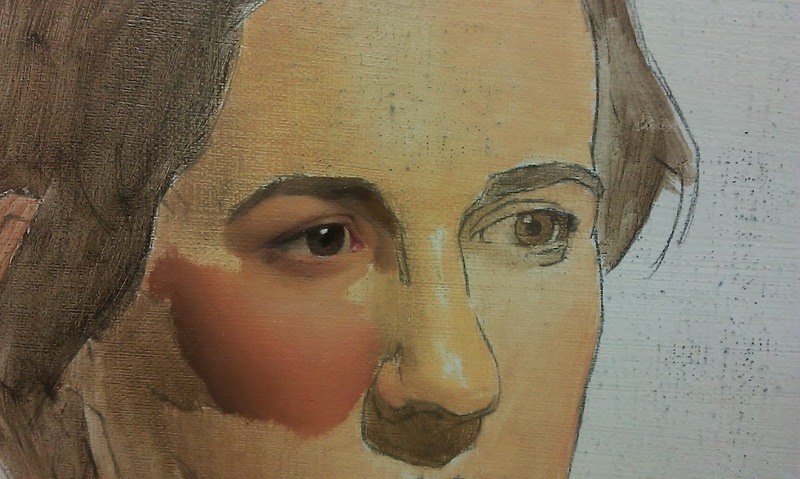 Is it an approach that gives you the hope to paint portraits from life that could literally take your breath away?....Yes! I highly recommend his workshops if you have the chance to attend. Yay ! 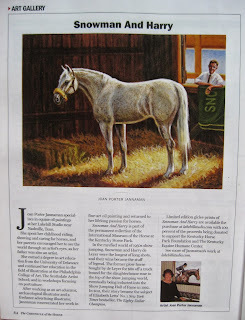 The October 21, 2013 issue of the Chronicle of the Horse included my painting of "Snowman and Harry" on their art page. I'm honored and excited to again be included in this very respected magazine. Following this magazine since the 1970's...it has a special place in my memory. An extra benefit to having the painting featured is that I hope it brings attention to the giclee prints of this painting that are available for purchase. Here are some photos showing the progression of the 11 x 14 sized painting that I did for the live auction event at this years Rood and Riddle Grand Prix dinner / fundraising event. 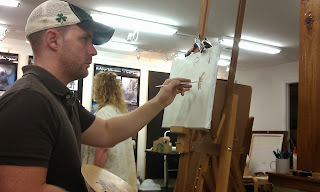 Since the method I use for oil painting requires the paint to dry a little between stages, I snapped some photos off my easel so patrons could see how the painting evolved back at my studio. They watched me put the finishing touches on it the night of the auction. The painting was swept up , still a bit wet with some final touches, and auctioned off! 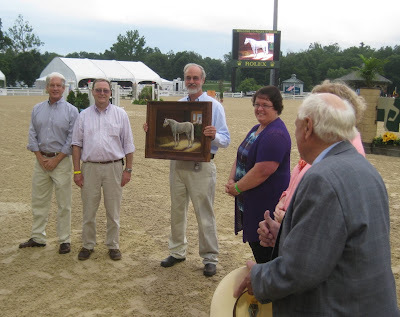 Many thanks to the winner and her generous support of the Kentucky Horse Park Foundation and the Kentucky Equine Humane Center with her winning bid. 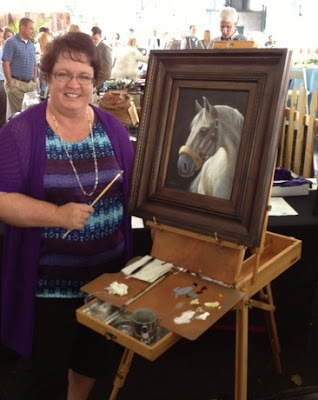 This piece now hangs at a beautiful farm in Paris, Ky. I started this one with a white canvas, no toning. I used an ultramarine and burnt umber thinned with odorless mineral spirits for this drawing that was done directly on the canvas with this thin paint. At this point....the general blocking in with geometric shapes, checking proportions, and the placement of the subject on the canvas are the goals. Gathering old black and white photos and a few color shots of Snowman helped me to understand how his head was structured and what specific markings he had. Years of studying horses enabled me to draw Snowman in a pose that wasn't already shown in any one photo reference. Continuing the drawing..... blocking in the halter. Visually measuring the spaces between the halter and the parts of his head.....in other words, checking on the negative spaces. Accuracy of your negative spaces is a quick way to tell you if your drawing is straying off course. Now that I have my sketch done....blocking in the dark background is my next step.....I check to see that the shape of the dark mass is going to work as a design element in the painting. If it doesn't work at this stage.... you had better change it now before you progress because a bad balance in design at the beginning is not going to get fixed by the details. It's like building a house on a good foundation. All along I knew that I wanted to make this a back/side lit design. Add your darkest darks into the subject. This is where you start to really use your ability to squint your eyes! That really helps...because as I said...this is where you want to check on the general pleasing nature of the design...does it flow, does it have balance? Does it lead your eye around the canvas and the subject? Satisfied with the major design decisions....I went ahead and started layering some color onto the background to make it more opaque. I stuck with ultramarine blue and burnt umber, making some areas heavier in the blue tones and some in the brown. At this point, I know that when I sign this painting, I'll be scratching my name into the last wet layer and revealing the lighter layer....here you can see that I've blocked in that lighter layer at this point in the lower left hand side. Here I am going back to Snowman's head and layering some half tones into his structure...starting to "carve" with the paint and show where the light is landing without being quite so hard edged. Softening the transitions between light and dark at the point. I went ahead and layered the last layer of dark background around the painting and scratched my signature in while it was still wet....revealing that lighter color that I placed there earlier. Who says you have to wait until the painting is finished to sign it? Also...slowly delineating the drawing with color...picking out the structure of his head with cooler bluer shades of white and grey. Beginning to block in a bit more detail such as the exact shape of the eye and the construction of the halter. Knowing that I've checked and double checked the drawing and feel good about it's accuracy by this point, now I can start layer some coat color, major markings ( flea bitten grey in this case). You may be able to tell that I made a change in his fleece noseband and muzzle area.... lengthening it just a little. Yes, that meant re painting that whole area...but as I said...better now than later! Still, at this point , squint a lot...make sure that your light is correct.... adjusting the hardness or softness of the edges. details are starting to drop in. Notice that I softened the harsh lines of his body so those lines and values would not compete with the head / face as the main subject. Feeling a little pressure to lay down the last details of this painting at the site of the auction, I absent- mindedly forgot to snap a good shot of the finished painting. In the steps that came after the last photo, I concentrated on the little details that included dropping in the warm highlights...glazing in some reflected light and some darkest small shadows. I especially wanted to drop in the details of his warm soft eyes. So, there you have him....... Harry's beloved Snowman. "The Eighty Dollar Champion, The Horse That Inspired a Nation", a New York Times bestseller by Elizabeth Letts has introduced the uplifting story of Snowman and Harry de Leyer to a whole new generation. It has been an honor to work on this project for The International Museum of the Horse. 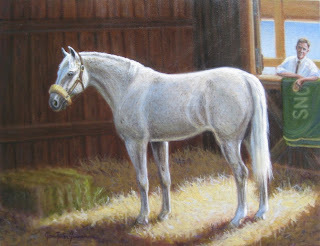 This 14 x 18 oil painting will hang in its permanent collection in Lexington, Kentucky. A formal presentation took place at the Kentucky Horse Park’s Rolex Stadium on July 27, 2013 during the Hats Off Day celebration. The author, Elizabeth Letts and Harry de Leyer were in attendance for the festivities. To say it was a memorable experience to be able to get to know both of these very talented people would be an understatement! Limited edition giclee prints of "Snowman and Harry" are now available. 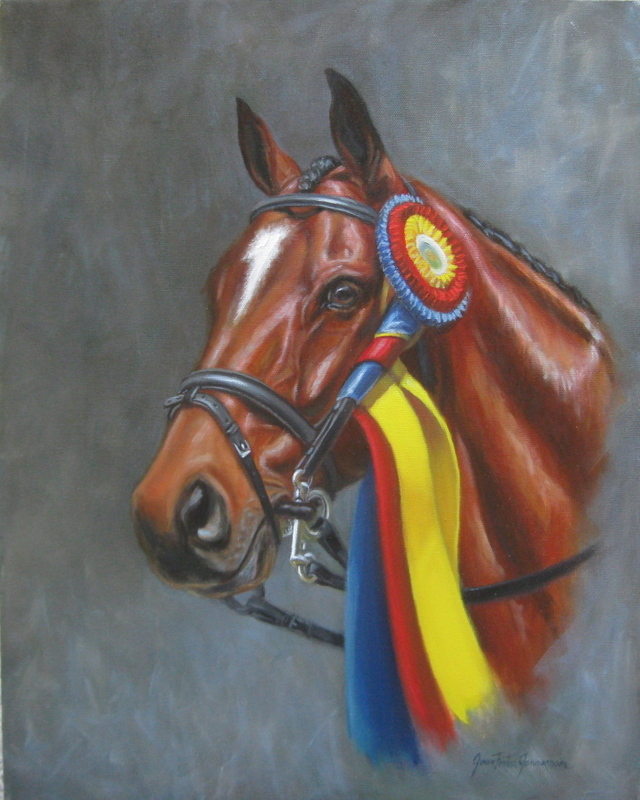 100% of the proceeds in sales from this giclee print edition of 250 will be divided between the Kentucky Equine Humane Center and The Kentucky Horse Park Foundation. 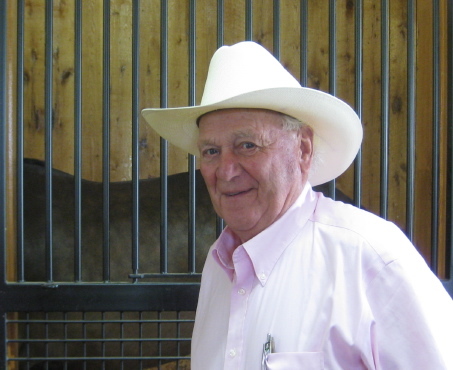 This year marked the 10th anniversary of Dr. Tom Riddle’s dedicated support of these two organizations through this fundraising event sponsored by Rood and Riddle Equine Hospital of Lexington,KY. Summer is Flying By ! Since my last post at the end of April I've been to Alaska with Len and a group of friends, to Delaware to visit family and to Florida for our summer family beach trip ( ahhh..my blood pressure just went down thinking of that one .... :-) ) So....when I stepped foot back in the studio I have been working long hours on some commissions and a very special project that I'll blog about soon. Recharged and excited about all of my in progress paintings. In the meantime, here are a few shots from Alaska .... an incredibly wild and beautiful place. If it's not on your bucket list, it should be ! The first picture is a view of a glacier while flying into Taku Lake Lodge near Juneau on a float plane. The next one are some of the incredible sled dogs who were anxious to give us a spin on the training sleds at the summer camp near Skagway. The Third picture is the black bear visitor who cleans up the good juices in the sand under the big outdoor salmon grill at Taku Lodge. No he is not tame. I had a long lens :-). The last shot was a crab from a very fun 3 hour cruise on the Aleutian Ballad in Ketchikan. Yes, the vessel is retired from the t.v. show "Deadliest Catch"..... I'm thinking this life is much easier demonstrating rather than actually heading out to the Bering Sea! This portrait will eventually hang in the home of Catherine Witt...yes, another name well know in the upper levels of Eventing as a dedicated owner! She not only owns "Parklane Hawk" but owns the horse who came in second this year at Rolex, "Seacookie"..both ridden brilliantly by William Fox-Pitt. 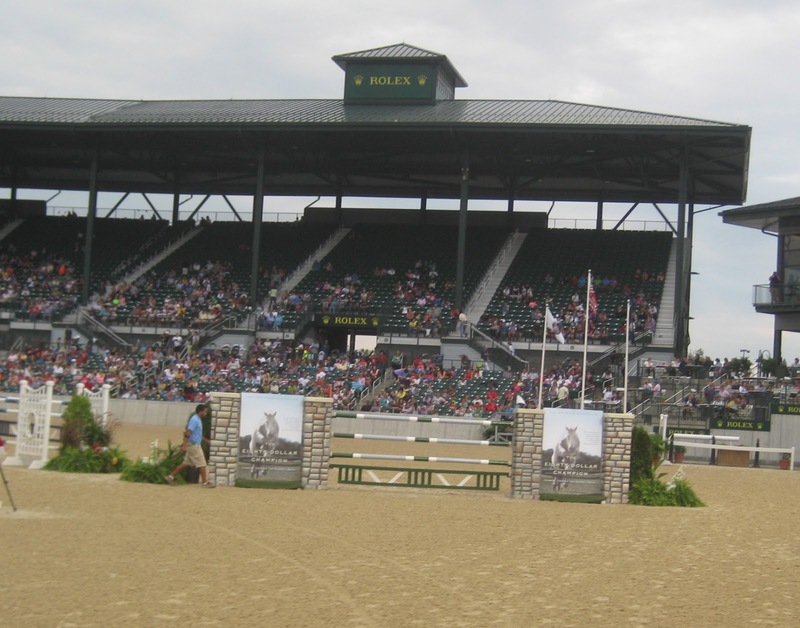 So, this week is Badminton Horse Trials 2013..... http://eventingnation.com/ can keep you updated on what's going on across the pond! In less than two weeks I will be at Belle Meade Plantation's Visitor center's art gallery to open my solo exhibition for May 2013. 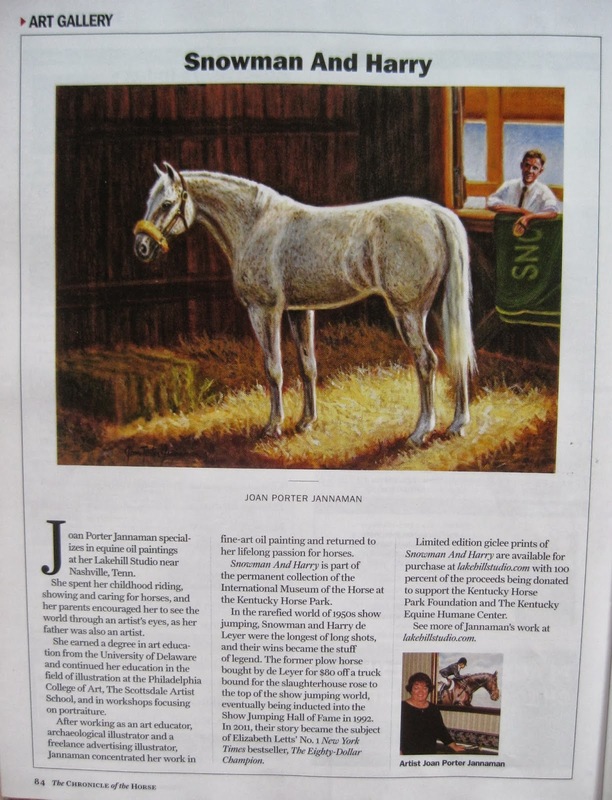 This will be my fourth year showing here and I feel fortunate to have the opportunity to show in a place so steeped in the history of both the thoroughbred and sporting art. The image you see here will be on the invitation postcards sent out in the next week. 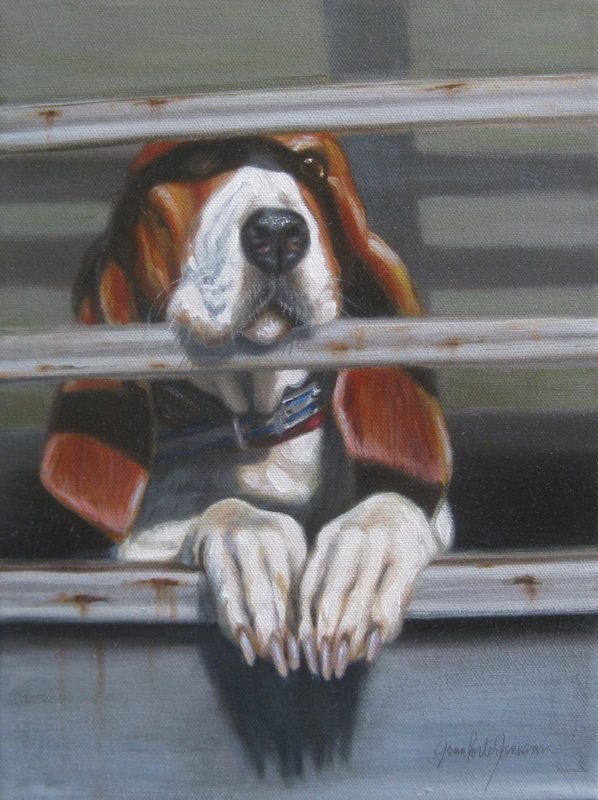 It is a portrait of one of the hounds of Chula Homa Hunt in Mississippi. "Anticipation" is a 9x12 oil and is your sneak peak of one of the paintings that will be hanging at the show. 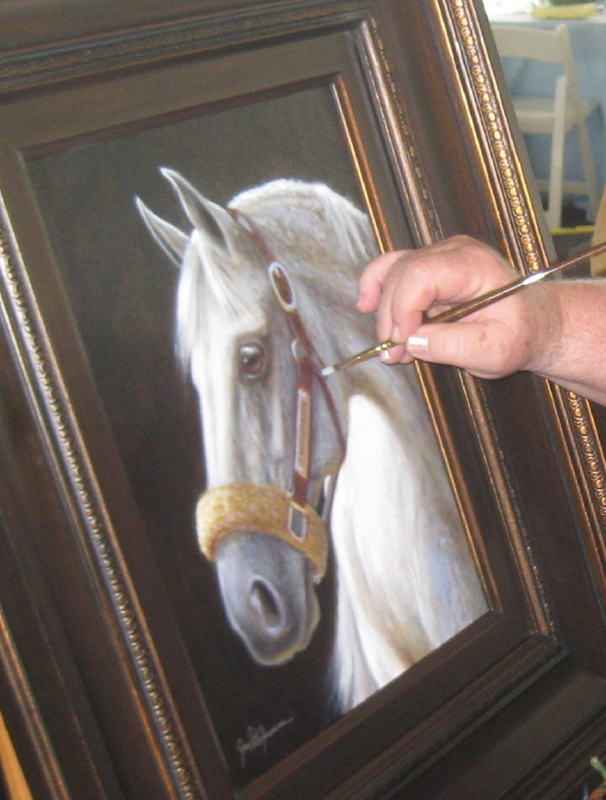 The show is a mix of subject matter that is all related in the world of equine sporting art and wildlife. West End liquors will provide a wine tasting and there will be light hors d'oeuvres. The opening reception is casual and held at Belle Meade's Visitor center ( 5025 Harding Pike Nashville, TN 37205) from 5:30pm to 7:30pm on thursday, May 2nd. Hope to see you there! A busy beginning of the year! 1500 shots. I came away with lots and lots of wonderful inspiration for future paintings. We knew that we would love it down under and we were not disappointed. Here are just a few snapshots that I pulled from the lot....... first is the Sydney Opera House, of course one of the most recognizable buildings in the world. Onward to Tasmania and the original site of the penal colony at Port Arthur. So many beautiful vistas around Dunedin, New Zealand with it's Scottish heritage apparent. This view was leaving Dunedin. After a visit to Akaroa and Wellington, we made our way to a sheep station at Clifton Bay, New Zealand. Enjoyed a great day walking around Mt. Maunganui in New Zealand.... some people we met there said it reminded them alot of the Monterrey Bay area of California. Piha beach. Also visited a rainforest area and enjoyed a relaxing hike to appreciate the local flora and fauna. Stopped by the Bay of Islands in North New Zealand where the weather warmed up a bit and headed back to Sydney on "Australia Day" Arrived with a big celebration in the harbor with Tall Ships and such. It reminded me of our Fourth of July celebrations, fireworks and all. Well....I left out a lot, but I don't believe in disgustingly long blogs. If I included everything I would have broken that rule! After arriving home and visiting family to celebrate my mother in law's 90th birthday and a trip to the Frist Museum with my son to enjoy the Dutch Masters exhibit....I'm so full of inspiration, I'm about ready to burst. That's a good thing because I only have 9 weeks until my solo show at Belle Meade Plantation opens and I'll be in the studio with blinders on until then!